The Prescription Drug Take-Back Day goal is to provide a safe, convenient, and responsible means of disposal of prescription medications. On Saturday April 27, 2019 bring your unwanted prescription medications to Community Memorial Hospital between 10:00 AM and 2:00 PM. Due to weather conditions this afternoon, Flight for Life will not be making an appearance at the MFHS Impact for Life. The other activities will continue as scheduled. Weather allowing, Flight for Life will be in MF at 12:40pm, landing near the High School. It is assisting in Impact for Life, an educational event for students on consequences of drugged/drunk driving. MFHS/Protective Services have partnered to bring this message to the school. Experience matters–in life and in law enforcement. MFPD recognizes the importance of experience and compensates its police officers accordingly. Join our ranks and you could earn a starting salary of more than $80,000 a year, 17 days of vacation, and paid sick leave upon hire. The crash on US41 has been taken care of. The left lanes are now open, HOWEVER construction in the area will now have the right lane closed as it was before the crash. Doing what we can to keep traffic flowing. 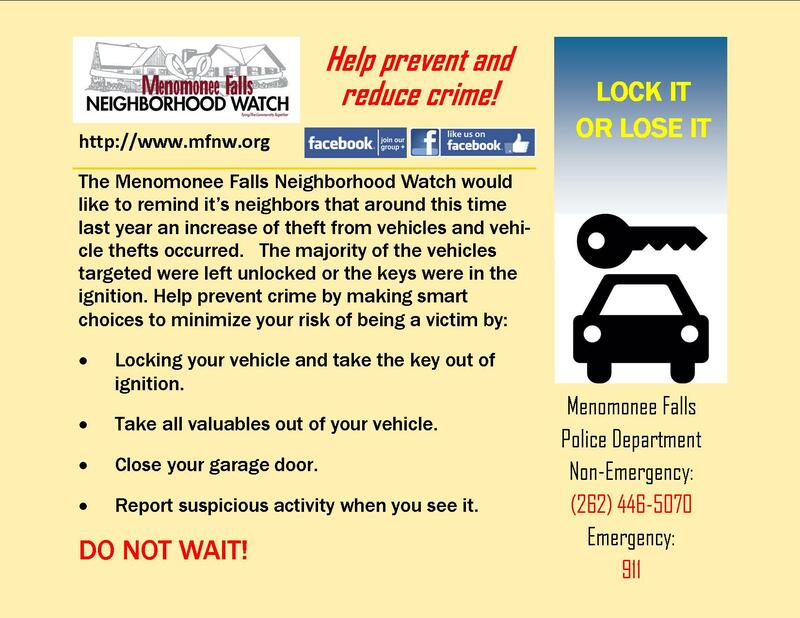 The objective of our Neighborhood Watch is to work in partnership with the Menomonee Falls Police Department in a cooperative effort towards preventing and reducing crime in the Village of Menomonee Falls, in order to maintain the high quality of life that we all enjoy. We act as an additional set of eyes and ears for our police officers. 01/25/18 – PHONE SCAM ALERT! 10/15/17 Fox6 with Greg Koepke interview.